Let me draw attention to some of the fascinating work on the Earl Grey Famine orphans currently in progress. Perry McIntyre and Karen Semken, for example, are working on a database comprising biographies of each and every orphan. It is an ambitious project. I can only wish them well. To aid them in this, I’m sure contributors to Facebook pages, such as Anne-Marie’s ‘Ireland Reaching Out’ or Karen’s ‘Earl Grey’s Irish Orphans’ and Melissa’s ‘Great Irish Famine Commemoration Memorial Community’, will be willing to help. Please do have a look. Kay Caball’s book on The Kerry Girls,The History Press Ireland, 2014, tells the story of the orphans from that part of the world. It’s a great read, and available on kindle. I’m rediscovering the wheel myself, finding material wrongly filed (ha- as if there ever was a system) among my research notes. Here’s a couple more photos I wasn’t aware I had. I didn’t use these pics in volume two of Barefoot because there was doubt about whether they were Earl Grey orphans. I knew from experience how difficult it was establishing if x and y really were part of the scheme. How does one confirm that they were? Some fundamental questions historians use, and I’m sure other disciplines too, are often forgotten–and not just by historians. How do you know that? What is the evidence? How reliable is it? Is it independently verified? A pity such questions are not more widely used in all walks of life. Finding hard evidence for this, in the lives of the orphans, is an almost impossible task, however much one would like to pluck something out of the air. In fact, I’m now prepared to argue that asking whether or not the orphans were ‘successful’ in Australia is the wrong question to ask. ‘Coming to Australia rather than staying in Ireland was better for the young women’, is another way of putting it. I’ve said that myself on more than one occasion. But that too should be questioned. My intention in this post is to show that coming to Australia was not the best thing that could have happened to every orphan–just in case I’m tempted to view their Australian lives through rose-tinted spectacles. It may well have been for the best. But how many examples, such as those I’m about to relate, does it take–ten percent, twenty, twenty-five of the whole– before we reject the claim? Maybe this too is the wrong question to ask. Everything, may I suggest, is up for debate. Let me tell you a couple of stories. They prevent me from being starry-eyed about the orphans’ lives in Australia. They are sad stories. Perhaps they shouldn’t be read all at once. At the age of eighteen, Catherine Toland, along with her fifteen year old sister Sarah, left the beautiful lakes, lochs and waterways near Rathmelton and Milford workhouse in Donegal (do have a look on Google Earth). They arrived in Port Phillip on board the Lady Kennaway early in December 1848. They had each other, and were lucky to be employed by the same person, Mrs Catherine Ro(a)che of Bourke Street in Melbourne. Just over a year later, Catherine married Mike Murphy, a Cork man, a marriage that would last until Michael’s death in 1882. Catherine and Sarah would remain close for most of their lives. Is there anything that strikes you about Catherine and Mike’s family reconstitution below? Perhaps you noticed the death of four of their children at Gledfield Station in early February 1863. They were buried on a rise overlooking the Wannon River: John was nine, William six, Lizzie four and Michael only two. The Coroner’s verdict at the inquest was “the four children were burnt to death by the conflagration of the hut in which they slept, but how the fire originated there is no evidence to show and no blame can be attached to any person“. At the inquest we hear Catherine’s voice but it is a simple statement of fact, devoid of the grief she felt. 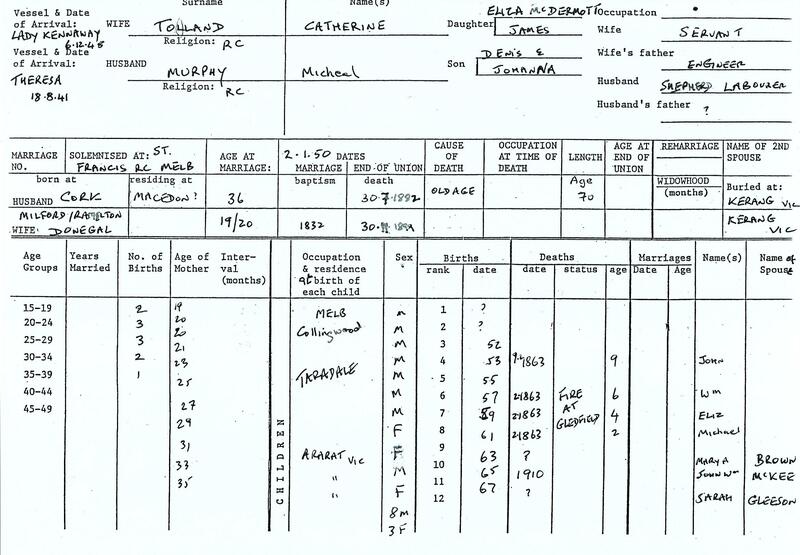 The local newspaper, the Ararat & Pleasant Creek Advertiser was to report on 13 February “the utter prostration and distress of Michael and Catherine Murphy was harrowing in the extreme…everyone present seemed greatly affected at the intense grief displayed by the parents of the unfortunate children“. There is a Murphy family history in the La Trobe Manuscript section of the State Library of Victoria. Later in life, Catherine, a devout Catholic, is reputed to have said I have suffered my Purgatory here on earth. I’ll surely go straight to heaven. Let me tell you the story of Mary Littlewood. Her’s is one I also find disturbing. In late 1846, ‘ragged and dirty’, Samuel (57) and Mary (54) Littlewood from Ballybreagh, Rich Hill entered Armagh workhouse along with their four children; 15 year-old Mary who was described as ‘thinly clothed and hungry’; 13 year-old Thomas William; 11 year-old John, and 9 year-old Ann Eliza. Over the next couple of years, in and out of the workhouse, the family was slowly destroyed. Described variously in these years as ‘very ill’, ‘delicate’, ‘thinly clothed and quite destitute’, residing in the ‘Union at large’, (i.e. homeless) the family broke apart. Samuel, a former weaver, died 25 February 1847. His widow, Mary, died 10 March 1848, shortly before their 16 year-old daughter (also named Mary) set out on her long journey to Sydney. Already psychologically affected by her famine and workhouse experience, 16 year-old Mary joined the Earl Grey in June 1848, along with other orphans from northern Irish workhouses. Once again, she watched the authorities impose their will on their charges, and she watched the ‘Belfast girls’ fight back. She may not have taken part in the ‘clash of cultures’ on board the Earl Grey but she certainly learned some ‘attitude’, and whose side she was on. Her first employment in Sydney as a servant apprentice was with J. C. Curtis at the rate of £9 per annum for two years. Alas, it was not to be. By the end of 1848 she was in court defending herself against the domestic violence inflicted upon her by Mrs Curtis of Sydney’s North Shore. You can read about the case in the Sydney Morning Herald for the first of January, 1849, beginning page 3 at the bottom of column 3. In late December, Mrs Curtis took Mary to the Sydney Police Court and charged her with assault. She claimed Mary had ‘struck her and threw a chair at her’. Fortunately, one of Mary’s neighbours, John Higley, believed Mary ought to have been the complainant and ‘engaged the services of Mr Nicholls, Solicitor, to defend her’. (He was later reimbursed by Immigration Agent Francis Merewether out of public funds). In court, Mrs Curtis denied she had ever struck the girl. But Nicholls produced two witnesses who testified “she saw Mrs Curtis…‘hammering the girl as hard as ever she could’, striking her on the face, and that the girl was bleeding”. The second witness confirmed this report, “adding that she found the girl nearly fainting from the loss of blood, and that she had considerable difficulty in conveying her to the residence of Mrs H. H. Browne, who most humanely received her into her house“. I lost sight of young Mary after this. But she surfaced again in Appendix L of the Legislative Assembly, New South Wales, Report from the Select Committee on Irish Female Immigrants (Petition of Celtic Association), printed by the Government Printer, Sydney, 1859–once again in a court case. But this time she had no one to come to her defense. (I reprinted the documents concerning her case in volume two of my Barefoot, pp.106-7). On September 7 1849 Elinor Magrath wrote to the Bench of Magistrates at Scone frightened by the “paroxysms of rage” that Mary was subject to. She explained that Mary had come to her and her husband Thomas as an indentured orphan apprentice on the 3rd January–just after the cancellation of her indentures with Mrs Curtis. They themselves were recently arrived immigrants from Ireland, if my memory is correct (ha). In her letter Mrs Magrath stated that “for the last six weeks” Mary was acting in a very strange way. “Her conduct is much like that of a person delirious or excited by drink”. I wonder what had happened. Did Mary have a mental breakdown? Had she just had enough of being told what to do? Was she fed up being locked away? Was she fed up with having no friends and being isolated in the country? Was she just very angry because she wasn’t allowed to see her male friend? On 14 September Elinor Magrath presented the same information contained in her letter to the two Justices of the Peace who made up the Bench of of Magistrates at Scone viz. “she refuses to obey my lawful commands or to attend to her duties as a servant, and is excessively insolent when spoken to”. On the 2nd September, before she went to church, she forbade Mary to leave the house, thinking she intended meeting a man outside. But Mary became “excessively violent”. Thomas had to deal with it, placing himself between Mary and the door. Let me out! Let me out, damn it! I’ll throw myself in the well. Damn me, damn my soul to Hell. Holy Christ. Open the door, open the window. Damn you to Hell. Damn you and the mistress to Hell! I’ll tear down the curtains, I will. The Bench cancelled her indentures and ordered she be sent to the Immigration depot at Maitland, in effect at her own expense, from the wages owed to her. Mary disappears thereafter. She obviously needed help and may not have received it. I have often wondered what happened to this angry young lost soul. Ellen Leydon (or Lydon) from Ennistymon in County Clare was also only 16 years old, when she joined the Thomas Arbuthnot in late 1849. She may well have danced and sang on deck, under the watchful eye of Surgeon Strutt, as the ship made its way to Sydney. Her life was full of promise. But she didn’t travel with Strutt over the ranges to south-western New South Wales. Instead, she went north, to Brisbane, where she was employed as an indentured servant by W. Coombes at the rate of £7-£8 for two years. Within the year, she had married Thomas Stanley, a brickmaker from Ipswich. 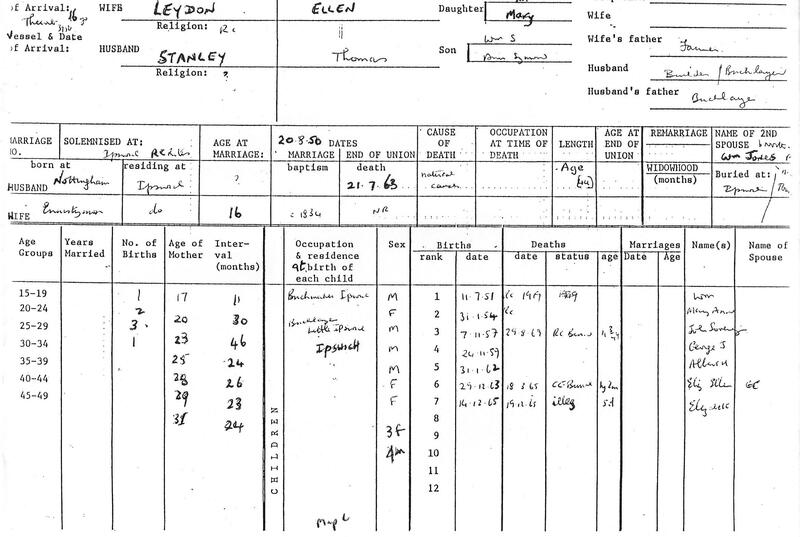 For research on the births, deaths and marriages of the Earl Grey orphans in the 1980s, I was given access to records in New South Wales and Victoria. An employee of the Registry of Births, deaths and marriages did work for me in Queensland. Here is Ellen’s reconstituted family from that work. Look carefully. By 1863, whilst pregnant, she has become a widow. Two years later she has a little girl whose birth is recorded as “illegitimate” but she, like her sister before her, is soon dead. I found Ellen again in the records of Dunwich Benevolent Asylum which is situated on Stradbroke Island, Moreton Bay. Remember to gain access to the Asylum an applicant had to have no visible means of support, either financial, or from a friend or relative. Some applicants would have provided information to suit their purpose. 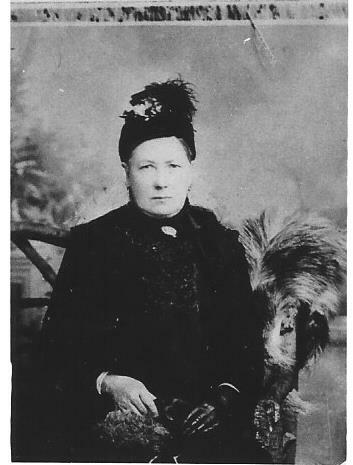 Ellen Agnes Hickson was “admitted, age 61, October 29 1895, from Goodna (Mental) Asylum. The cause of her admission was ‘old age’. She was born in Clare, Ireland, and her religion was Roman Catholic. Her trade or profession was that of ‘Housewife‘ and she could read and write. Her father was John Leyden, a farmer, and her mother was Mary Cronin”. It was Ellen herself who provided the information. “Married? Yes, six times. 1st: to Thomas Stanley, 14 years of age” (I assume this is the age she thinks she was), “in Ipswich. He died July 21 1862. 2nd: to Thomas Heffernan, 27 years , in Ipswich. 3rd: to Hugh Munro, 30, Ipswich. 4th: to William Jones, forget age, in Cairns. 5th: to James Dwyer, forget age, in Maryland, New South Wales. 6th: to James Penrose Hickson–died 1889–Charters Towers”. Ray Debnam has confirmed these marriages; to Thomas in 1866 with whom she had two children, Hugh in 1871, James in 1875, William in 1886 and finally James Hickson in 1888. He actually died 16 December 1891. Ellen may not have had the best memory for dates. I don’t think the researcher in the Queensland BDM records could have uncovered this complicated history with the pittance I was offering. What always impresses me is the geographical ground the famine orphans travelled; just look at the distance Ellen’s travels covered. “How many children did you have? Thirteen. 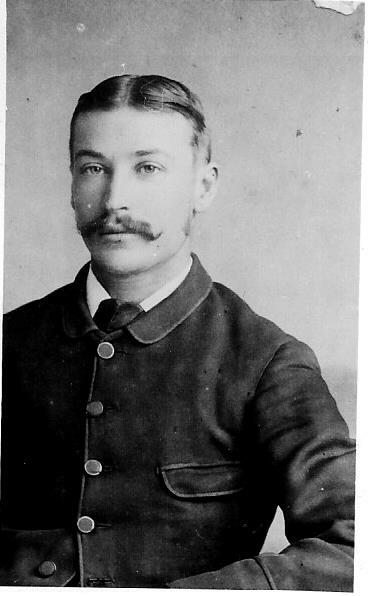 Ten by my first marriage– William Stanley. He’s 44 and lives in Sandgate. Thomas Lot, don’t know how old. He’s in Strathpine. John Sovereign. He’s dead. George James is dead I believe. Alled Henry is in Charters Towers. One died at three days old. Mary Ann is dead, Elizabeth Ann is dead. Can’t think of the others. I had two children by my second husband, Jerry Joseph who’s in Charters Towers, can’t remember the next. I had one only by my third husband. She–Jane–died in infancy”. I wonder how one should read this record. Given Ellen was married six times and had thirteen children, and given she was 61 years old and had spent time in Goodna Mental Asylum, that’s a pretty good memory is it not? Or do you think she should have had closer emotional ties to her children? It certainly raises questions about the accuracy of the information we have in our family reconstitutions. “I came to Australia in 1850 and landed in Sydney. I remained in New South Wales for three weeks then came to Moreton Bay. Then I went to Ipswich and remained there for many years. Then I went up North and remained up North many years and on the death of my husband Hickson I went wrong in the head and was in Goodna for a long time. The last two years were spent in the Asylum at Goodna. She has no money and no property. She went on leave from Dunwich February 11th 1896 until ? 1896 She stayed beyond her leave and was struck off, 28 May 1896. She was readmitted 6 October 1897 and remained in the Benevolent Asylum until her death 16 December 1901″. Here’s a pic of Woogaroo Mental Asylum, later known as Goodna, now Wollston Park. It was built at Wacol in 1865. I remember it was a very hot day when I took the pic. The building was close to a river and I hope cooler for the inmates than I imagined. In some States access to Asylum records is more freely given than in others. Personally, in the interests of good health, I believe we should be as open about these things as we possibly can. But I understand the contrary argument too. I’ll not mention any other names. 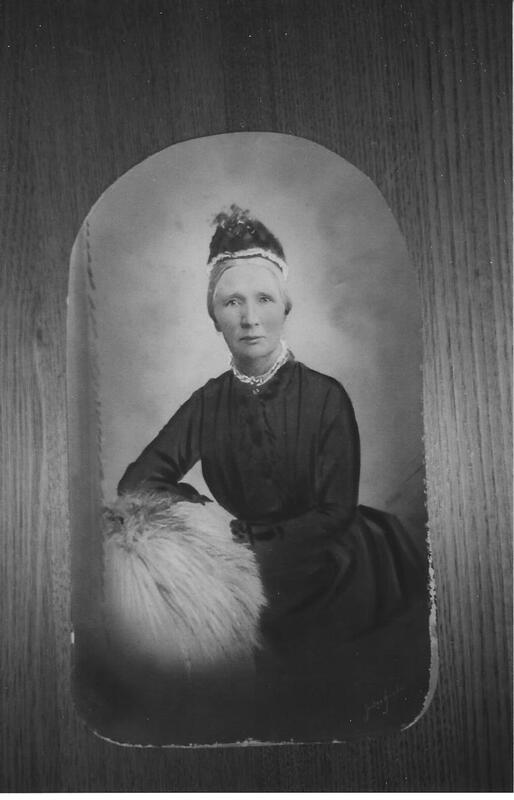 Ellen would have had the company of many an Irishwoman in both institutions, Dunwich and Goodna. Explaining this is not an easy task. Should we make something of their Irish background, their ‘collective memory’ of Estate clearances, Famine or family upheaval? Or was it a result of their demographic history; many of them married much older men, and in the days before pensions or ‘social security’, vulnerable women were more likely to end up in such institutions? I leave that for you to ponder. My thanks to the Picture Collection of the New South Wales State Library. The photograph is of “Women Residents in the Newington Asylum” c. 1890 SPF/1170. The case books of such institutions make for sad reading. “Attack came on suddenly. Loud crying. Seems to have a desire to injure others. Bodily health good”; “melancholic with great emaciation”; “having been exposed to much hardship and trouble”; “has threatened to drown herself”; “very excitable and quarrelsome”; “a strong bony woman. She expresses herself with vigour and delusions”; “a thin wrinkled old woman who smiles when spoken to and always sits holding a cloth to her left cheek”. A number of the Earl Grey orphans would spend some period of their life in such an institution in Australia. Exactly how many would spend any time in prison, in lying-in hospital, in Benevolent Asylum or Mental hospital is unknown. Maybe when Karen and Perry’s database is complete we’ll have a better idea. To return to what I was saying earlier, I don’t think looking at the ‘success’ (or its corollary, ‘failure’) of the orphans is the right way to go–too judgemental for my liking. Trying to decide whether coming to Australia was the best thing the young women could have done, interesting as it may be, is in the end pointless. I’d much prefer to research subjects such as the following; what was it like living as a shepherd’s wife at Ross Bridge on the Wannon River or what was it like living in Brisbane or Ipswich in the 1850s? Did any of the orphans see the last public execution in Brisbane in 1855–of the great Aboriginal warrior, Dundalli? (I’m really looking forward to Libby Connors’ book on Dundalli which Allen & Unwin will publish in the next month or two). What kind of life was there for a gold-miner’s wife at Ballarat or Castlemaine? What work did you do ‘on your selection’ in the 1860s? Who exactly were the German family members of your husband in the Clare valley in South Australia? The possibilities are endless. I’m sure you can think of others. Scusi. I seem to have wandered. I haven’t even started on “Arrival”. And a trip to the Mt Tomah Botanic Gardens beckons at this time of year. This entry was tagged Anne Lawler Thomas Higgins, Armagh workhouse, Catherine Toland Michael Murphy, domestic violence, Dunwich Benevolent Asylum, Earl Grey orphan facebook pages, Ellen Leydon, family reconstitutions, Goodna Mental Asylum, Jane Clarke, Lady Kennaway, Mary Littlewood, Milford workhouse, Ray Debnam Feisty Colleens. Bookmark the permalink.